Gutsy rock instrumental. An atypical Parsons track but one that makes an excellent platform from which extensions and remixes can spring. If recording a song with Alan Parsons is on your bucket list this is the type of track where making it so could be done relatively easily. Musicians on this session are all Vegas A-Listers, delivering solid and powerful performances, none more so than Eddie Rich with his rasping lead sax. 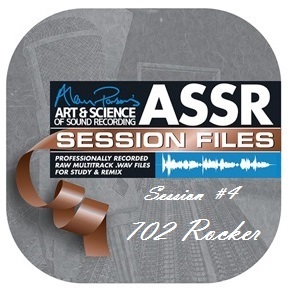 702 Rocker is an instrumental but its insistent groove could make a great bed for vocals. As it is, the song is quite short but it could be extended by copying and looping. Lean and mean, this would be a very good place to start for those with less experience or those who want to load it into a DAW with restricted capacity. There are 26 tracks and file size is just 1.3GB. Straight-ahead rock: perfect for cutting your mixing teeth on.